We at the Holt invite you to partake in a piece of history and live the luxurious life so many of the previous guests demanded on a daily basis. Our vintage building offers many spacious unique one and two bedroom floor plans. Amenities include fully equipped kitchens with ample counter and cabinet space, hardwood or laminate floors, large walk-in closets, unique architecture, gated private parking and much more. From a historic landmark at the center of the Wichita Falls Downtown Depot Square Historic District to a new life as a twenty-first century state-of-the-art apartment community....... The Holt awaits you! 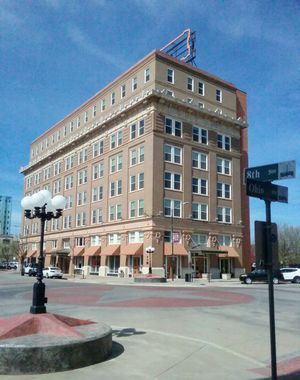 The Holt, originally constructed in 1910, was Wichita Falls first high rise building. In 2005, the Holt was renovated and converted into 41 upscale apartment homes. The award winning renovation preserved the building's original architecture and restored the national historic landmark to its former glory. Located in the heart of Wichita Falls Depot Square Historic District, the Holt provides a unique living experience for a wide range of people in North Texas. Way back in 1910, city builders Joseph Kemp and Frank Kell needed a place to house their growing business enterprises. The Kemp-Kell building housed the City National Bank and many of the most important early business enterprises in Wichita Falls. The Kemp-Kell building was the first of many skyscrapers to be built in downtown Wichita Falls. As business interests grew in Wichita Falls, the building was sold in 1926 to George Holt, entrepreneur and hotelier and H.S. Ford, theatre man. The bustling business boom created a tremendous need for hotel rooms. Holt and Ford turned the building into a state-of-the-art hotel with parlors, suites, radios and even air conditioning. Guests arrived in Wichita Falls by rail and walked to this beautiful modern landmark to enjoy the hospitality of Wichita Falls. Our community drew people from around the world, many seeking fortunes in the booming oil business. In its time the Holt played a host to many notable guests, including Eleanor Roosevelt, then first lady of the United States, and even Sally Rand, the world famous fan dancer. The Holt became the center of social life in Wichita Falls. © 2019 The Holt Apartments. All Rights Reserved.